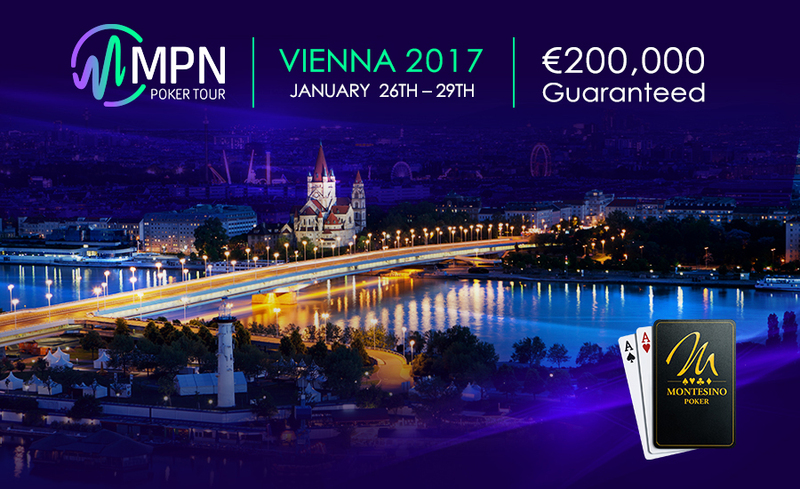 MPN Poker Tour Vienna is the first stop of the 2017 tour taking place at Montesino in the beautiful Austrian capital from January 26 to 29 – with a €200,000 guarantee for the €550 Main Event. MainEventTravel has a host of great accommodation options including the official event hotel, Roomz Hotel Vienna. Montesino has a long history of running excellent poker events and also houses a restaurant and a sports bar. The MPNPT’s return to Vienna next month follows its highly successful event at the start of 2016. The Main Event attracted 441 entries, generating a €241,500 prize pool - way over the €200k guarantee. German player Jannis Brauer was the champion, scooping €54,000 for his victory after beating Lazlo Toth heads-up. Also on the 2017 schedule are the €150 MPNPT Austria Poker Cup (with €20,000 guarantee), a €1k High Roller, a €50 team tourney, €100 NL Turbo and the MPN Vienna 9 cash game in which nine online qualifiers compete for a share of a €30,000 prize pool. Located on the banks of the famous Danube river in Austria, Vienna is often described as the cultural capital of Europe and was home to Mozart, Beethoven, Schubert and Johann Strauss. Now the city will be home to hundreds of poker players.